It was during his college summer job that Bob O’brian embarked on his profession of drawing people live. Working on the boardwalk in Ocean city md for 3 summers starting back in 1971. After a stint working on Jackson Square in New Orleans where Bob left in 1974 and eventually landed in Houston Texas . He started up working drawing live caricatures at the Houston Livestock and rodeo and from there to establishing a business at one of Houston malls for the next 10 years. Bob has since moved to Dallas where he freelances doing his caricature work at private parties, weddings, trade shows, mitzvahs etc. Also about a year or two ago Bob began drawing his caricatures electronically on digital tablets. 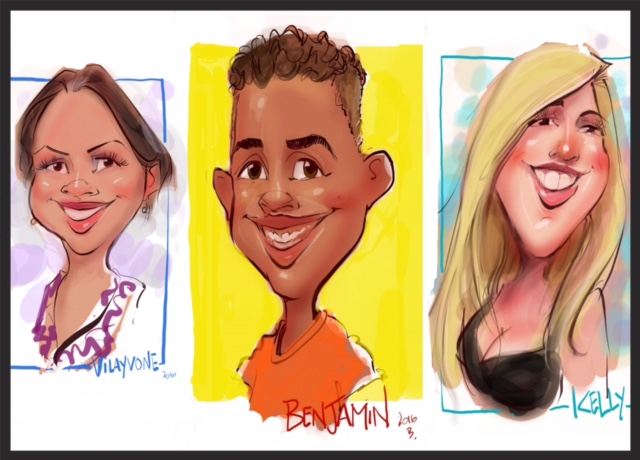 He set up during the summer weekends at the Gaylord Texan to retail his caricatures and get some experience w this new computer age approach to art. And hopefully I can draw some of you at the demo and demonstrate how this new art is changing my approach to drawing faces.